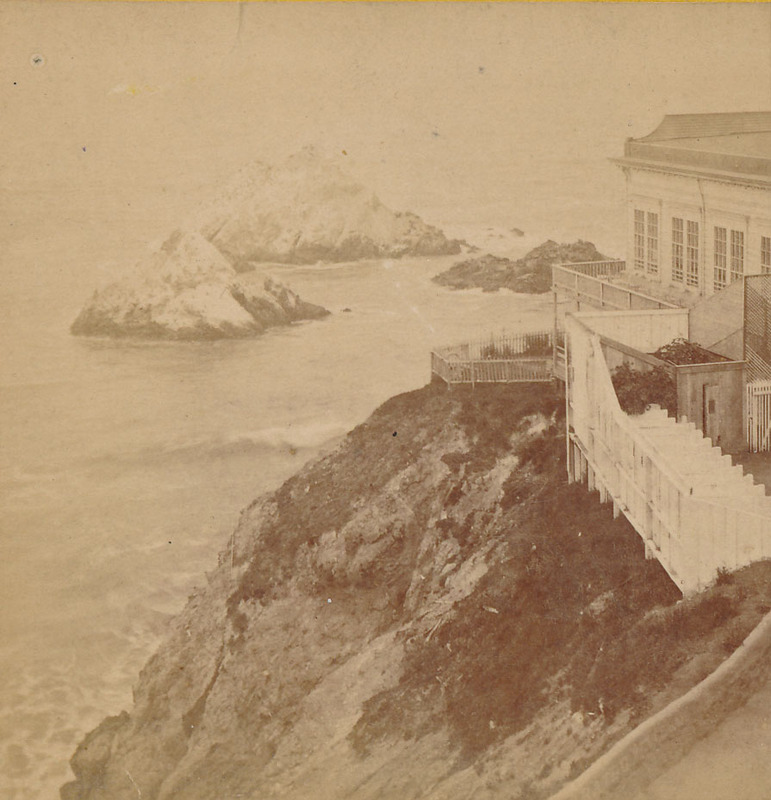 This version of the Cliff House shows the original 1863 structure surrounded by additional wings on both sides. 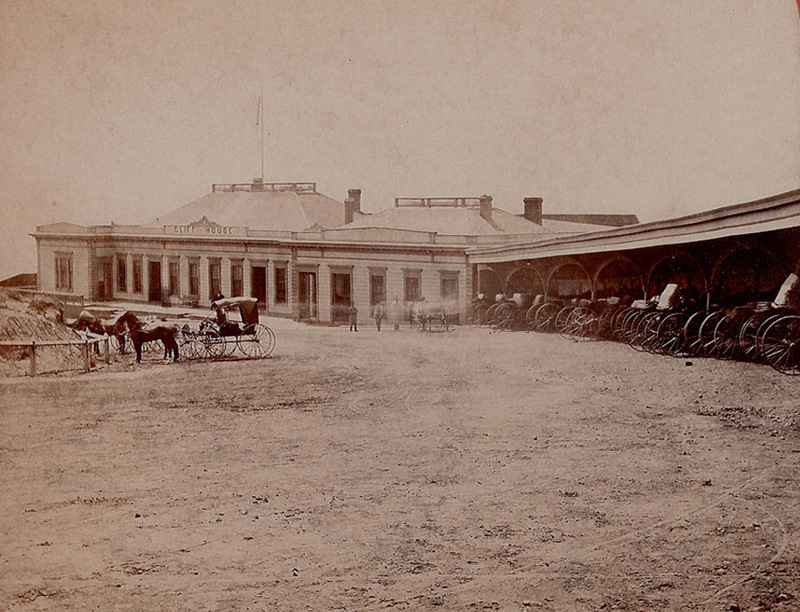 Photo likely taken sometime after March 9 1888, due to "S.F. 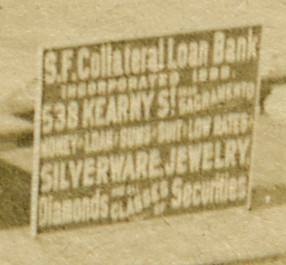 Collateral Loan Bank" sign, far right. 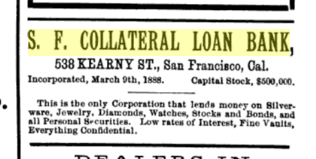 According to this ad the business was "Incorporated, March 9th, 1888"
Note cables between shore and outcrops. Click here for close-up. 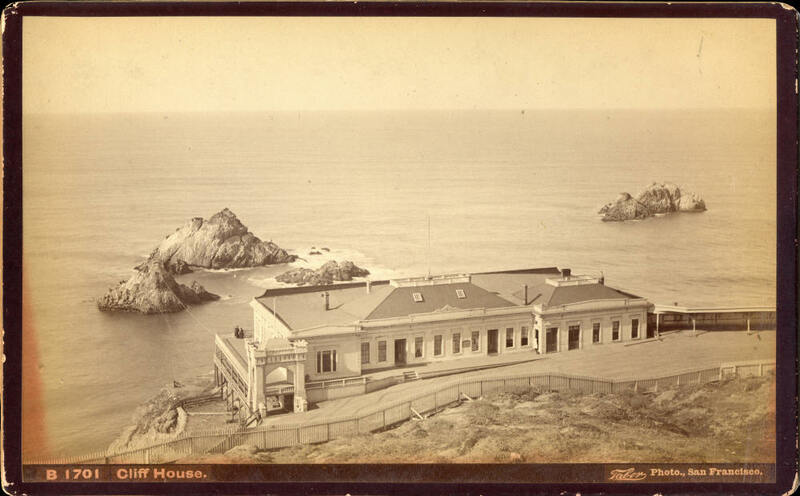 "BEHRMANS COLLECTION, CH-3 CLIFF HOUSE & SEAL ROCKS S.F. 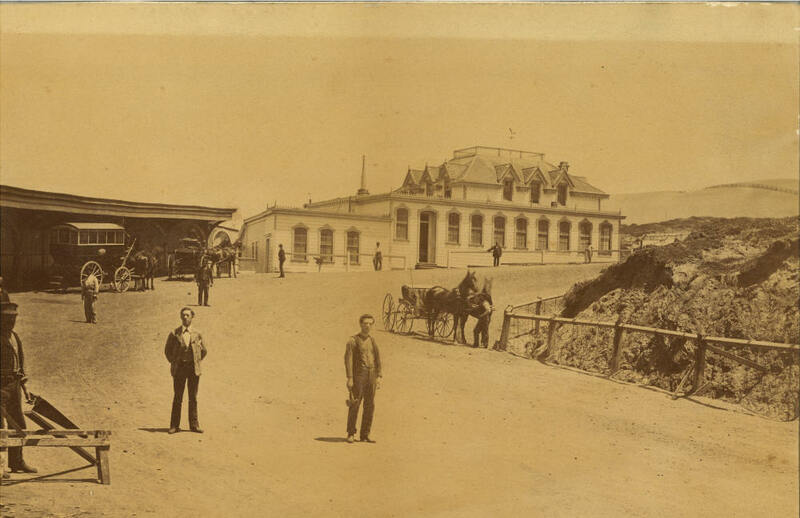 1887"
After considerable analysis the above photo is believed to date between 1887 (when the canal was built) and Dec 1894 (when the structure was destroyed by fire). The bridge to Flag Rock is already destroyed. This image points out structural comparisons. "2780 Cliff House, San Francisco. 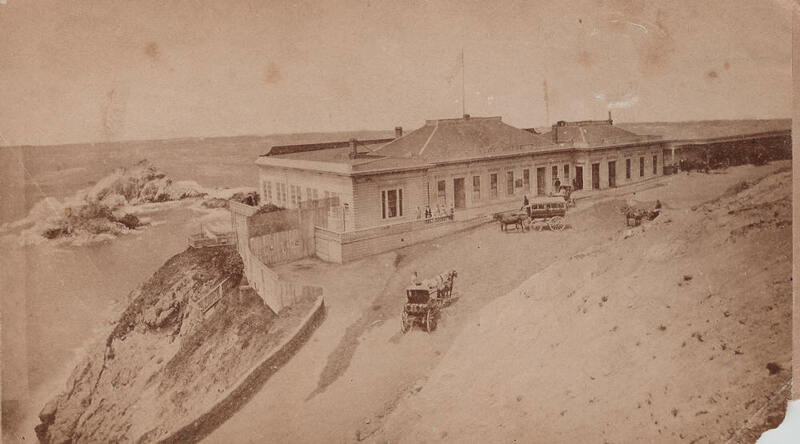 Taber Photo" "Moxie"
Note the fence signs: "Damascus Perfume Palace, Phelan Blk", "King B Bitters & Liver Cure"
"Everything about the photo points to the mid-1880s: Sutro has given the Cliff House a new coat of paint, Taber is at 8 Montgomery St., and the only ad I have for the Bitters is 1884 (see below). 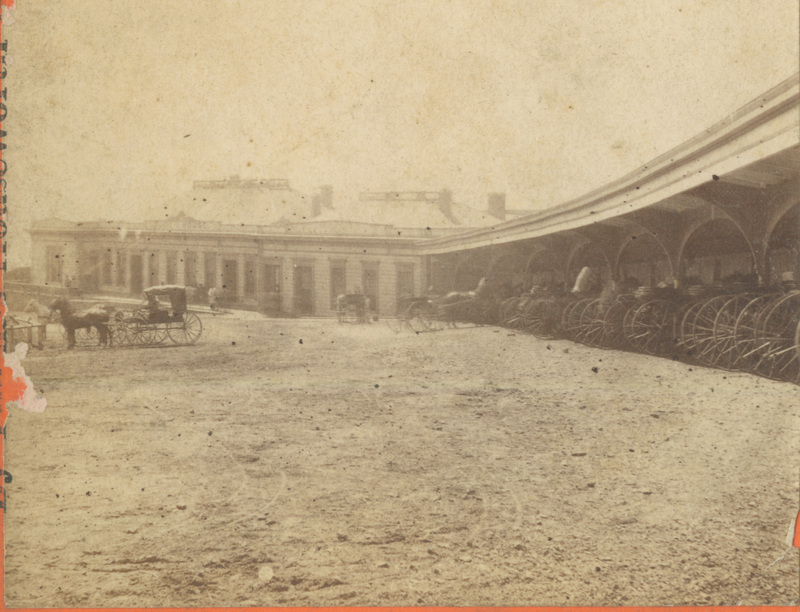 Archibald Stoddart and his brother James ran their Damascus Perfumery Palace at 826 Market in the Phelan Bldg. 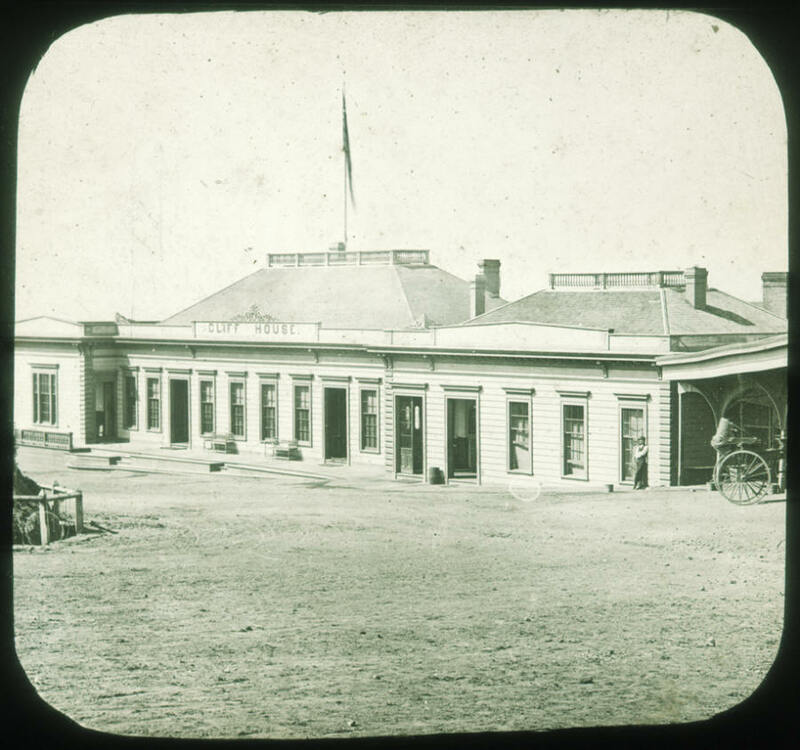 Their peak was 1884-85. I've attached a scan of a face powder sample envelope that lists the products and their two locations. They packaged their liquid perfumery in a small (3 to 4 fl oz) amber glass bottle that was heavily embossed." 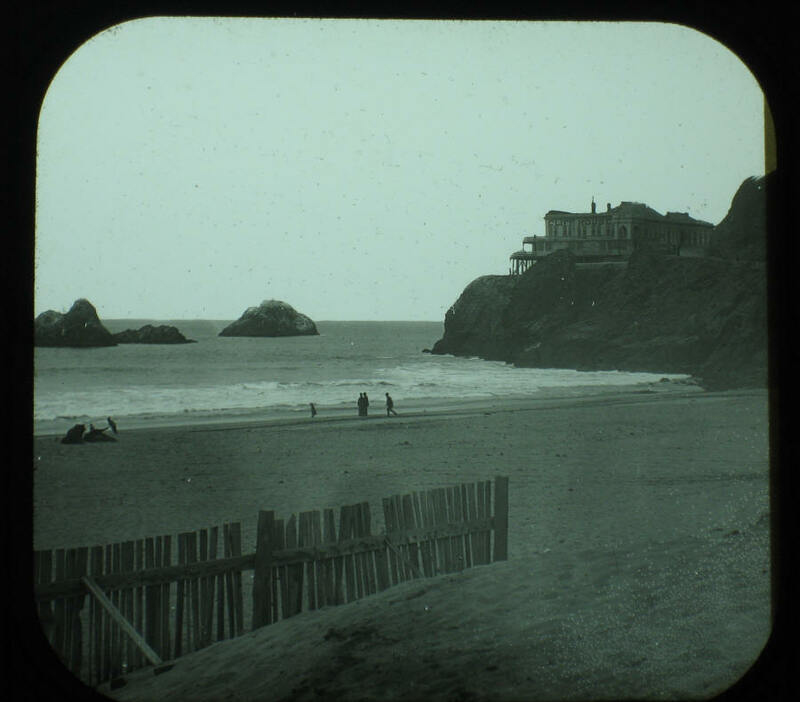 Reverse is stamped: "HELEN D MOSELEY COLLECTION, NATIONAL STEREOSCOPIC ASSOCIATION"
View looking up Cliff Avenue towards "Cliff House Cottage." 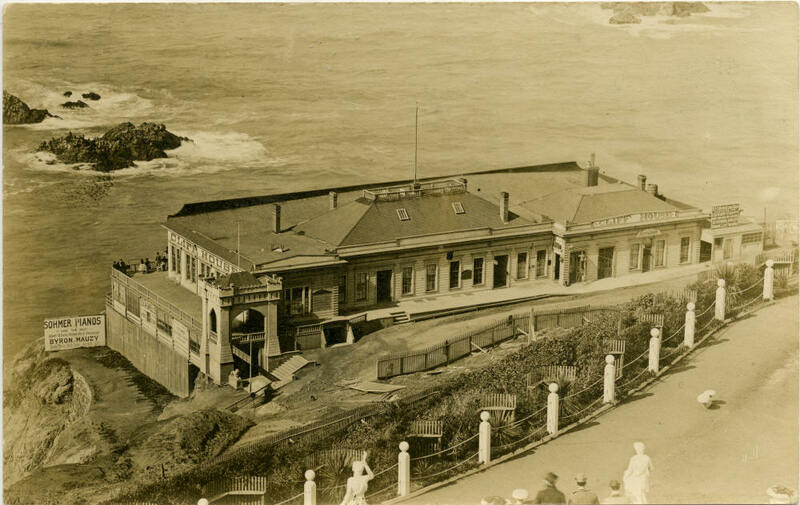 Carriage sheds for the Cliff House are at left. Image courtesy of Grace Winterton, click here for additional photos. 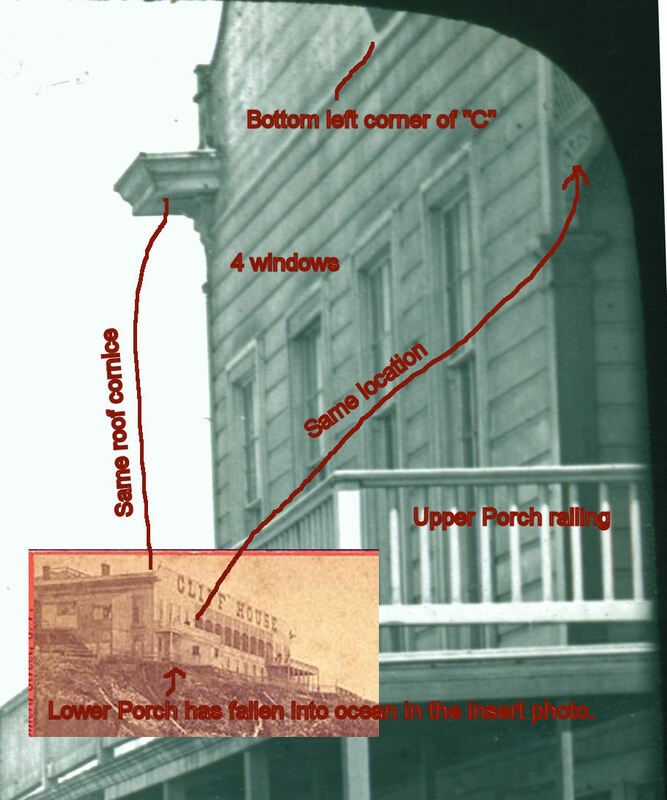 "I came across an 1870s SF newspaper article that explained that "LS" on the front of the Cliff House was a sort of pun. The letters stood for two Latin words (that I now can't remember) that also appeared on the corner of legal documents of the era that translated to "place for the seal" -- referring to the embossed legal seal. 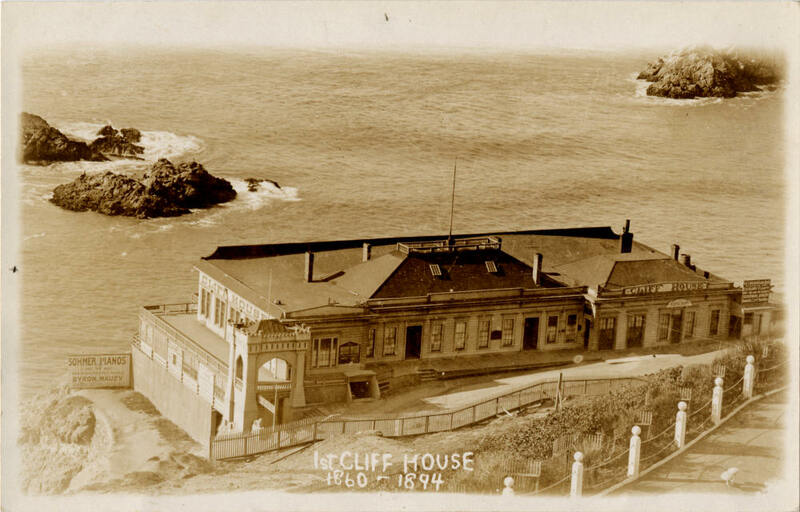 The pun, of course, was that the Cliff House was also the 'place for the seal.'" 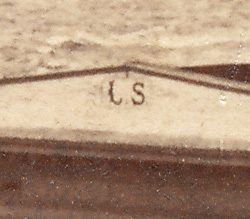 Zoe Heimdal: “LS” actually stands for “locus sigilli”, Latin words meaning. “the place for the seal”. My Bohemian wanderings were confined to the limits of the city, for the very good reason that there was little elsewhere to go. San Francisco was then bounded on one side by the monotonously restless waters of the bay, and on the other by a stretch of equally restless and monotonously shifting sand dunes as far as the Pacific shore. 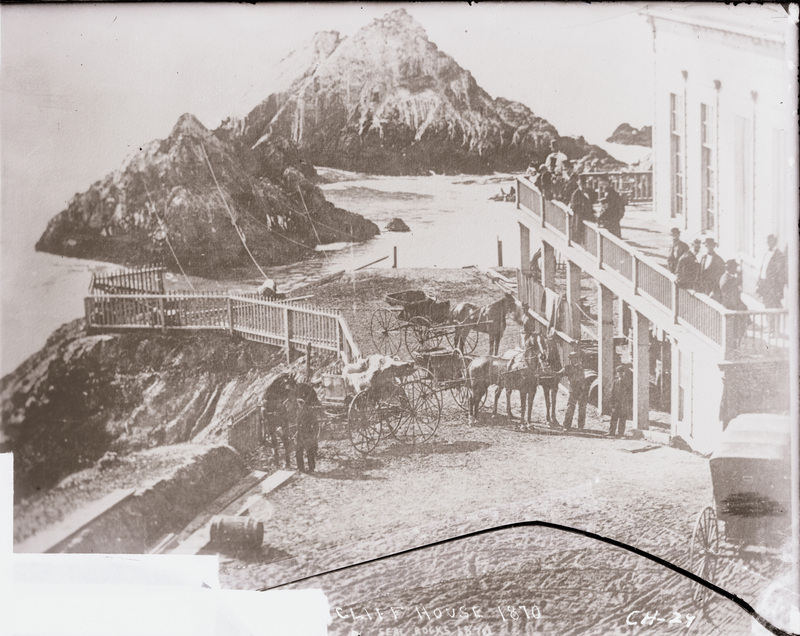 Two roads penetrated this waste: one to Lone Mountain--the cemetery; the other to the Cliff House--happily described as "an eight-mile drive with a cocktail at the end of it." Nor was the humor entirely confined to this felicitous description. 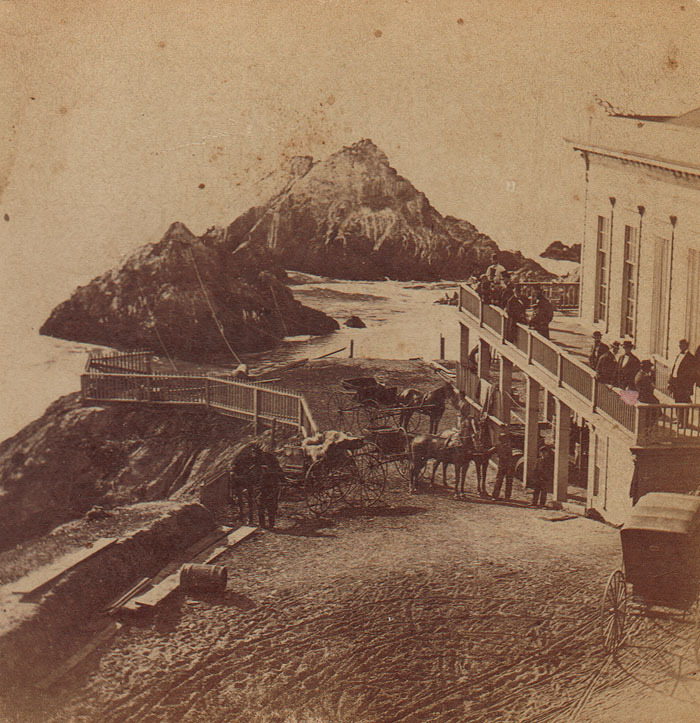 The Cliff House itself, half restaurant, half drinking saloon, fronting the ocean and the Seal Rock, where disporting seals were the chief object of interest, had its own peculiar symbol. The decanters, wine-glasses, and tumblers at the bar were all engraved in old English script with the legal initials "L. S." (Locus Sigilli),-- "the place of the seal." 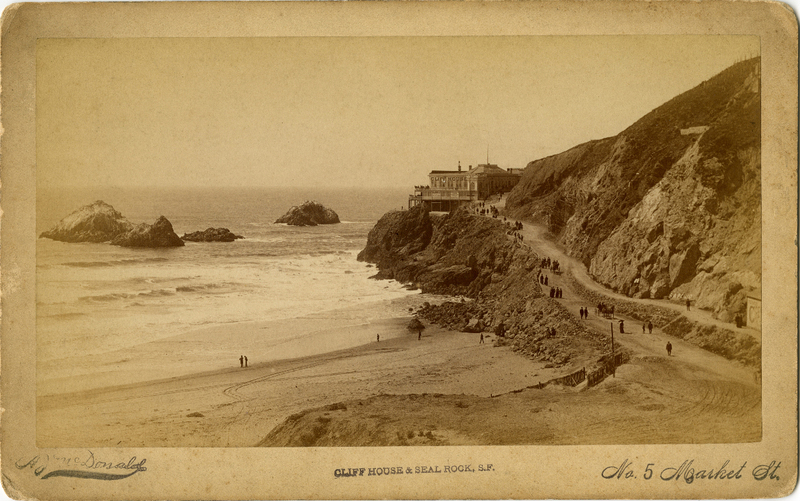 "The Merry Little Maiden playing in the Surf, San Francisco, Cal." EXTRA CREDIT to anyone who can identify the structure on the beach, foreground left side. 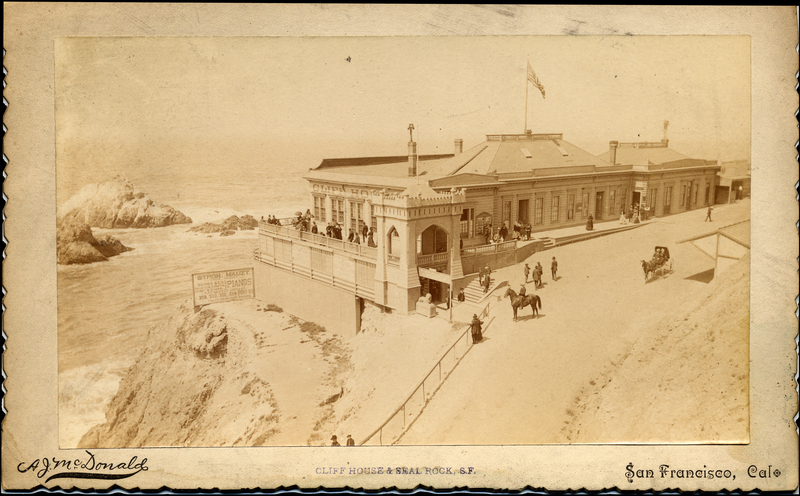 "B 1295 View of Cliff House from the Ocean. Taber, Photo, San Francisco." 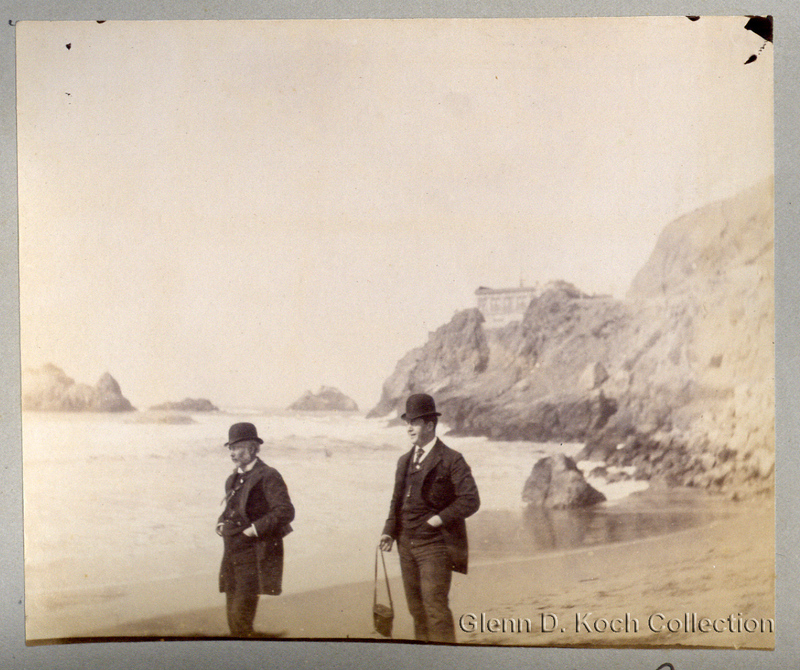 "CALIFORNIA - How to go There and What to See By The Way, by Charles Nordhoff"
This engraving was taken from a page of an old history book, Pecularities of American Cities by Captain Willard Glazier, 1886. Engravings were common in books during the 19th century, before photos became more economical. The image was scratched into wood or metal and then used to make the print on the paper. 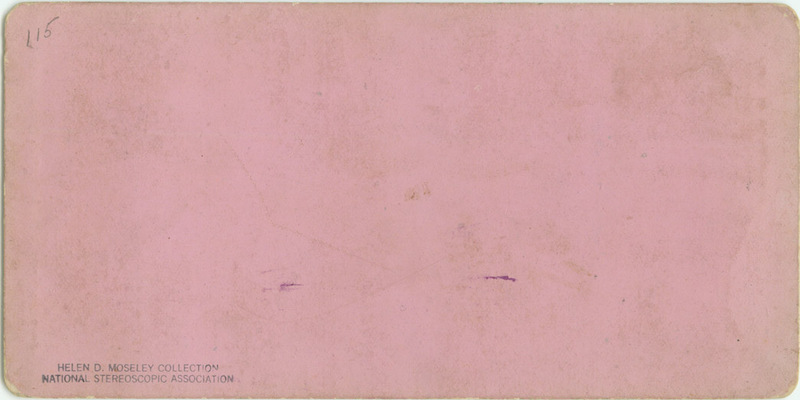 This 1893 letterhead shows the existence of JM Wilkin's shell shop. The later 1896 Cliff House also had a shell shop.